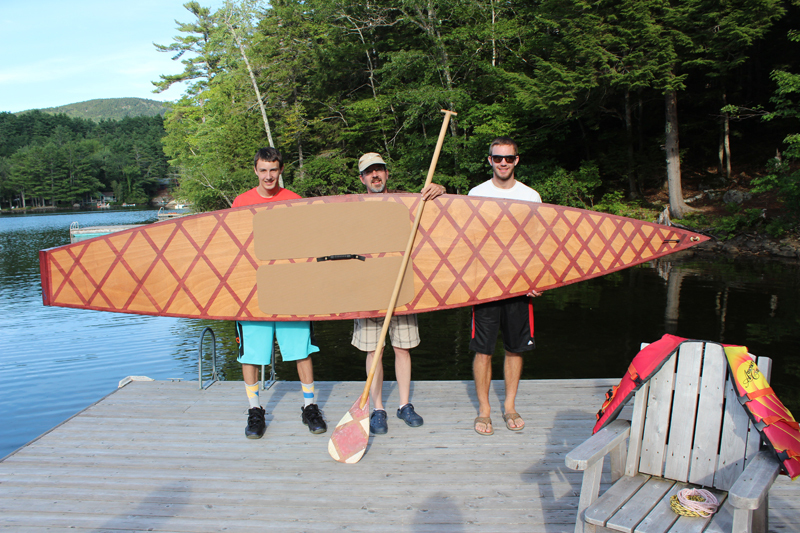 Allen Kay and his sons (Colin on left, Ian on right) finished a 14′ Kaholo just in time for a short paddle in Maryland before hauling it to Lake Megunticook in Maine for two weeks to put it through its paces. “They love it,” Allen says. “We used it in combined motorboat wakes and wind-driven waves. That long hull is fast, really fun, and worth the trade-offs of a big board.” His sons came up with the stunning deck design and executed it. This is the family’s second wooden boat. They also have a six-hour canoe they built and are now contemplating something in the sailing realm. For more information on this design, see http://www.clcboats.com/shop/boats/surf_boats/sup/kaholo-stand-up-paddleboard.html.